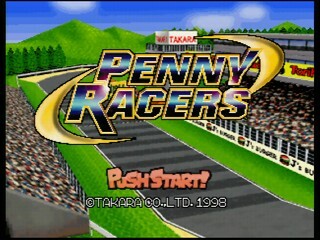 Developed by Locomotive Corporation in 1999, Penny Racers for the N64 is a little more than your average kart-style racing game. Sure, you have a bunch of miniature cars racing around a variety tracks as per usual, but the wide assortment of weaponry available and high level of customization available makes this game stand out. It wasn't until quite recently I found out there was actually a hidden turbo start in this game. It must be one of the most convoluted turbo starts in a race game that I know of as well. It also only works in time trial mode and not in regular races. I found it out by myself comparing my times to known records where I could beat the best laps but not the track records at all. Indicating there was a way to get the opener lap much faster. When I finally got the turbo start I could improve all my times with several seconds as the fastest engine of the game also has the slowest acceleration. Instant maxspeed therefore has a huge effect. It works by accelerating up to about 5 on the speedometer and the reversing the engine while letting go of the accelerator. The reversing the engine and letting go of the accelerator has to happen at the instant before the third red light flashes on. You can also not go over 5 on the speedometer. Then when the race starts immediately let go of reverse and press gas. It comes extremely narrow to get it to work but it has a huge effect.